Electric lighting has been around for over 100 years. With changes in bulb technology, there are more bulb choices now then ever before. When choosing a bulb for your lamp there are only two real factors to consider: what fits and what you like. There are styles, colors, and efficiency, but all of those fall under what you like. We will tackle one question at a time. Most bulbs sold in the US are E26 screw type bulbs. This means they are Edison base (E) and 26 mm in width. 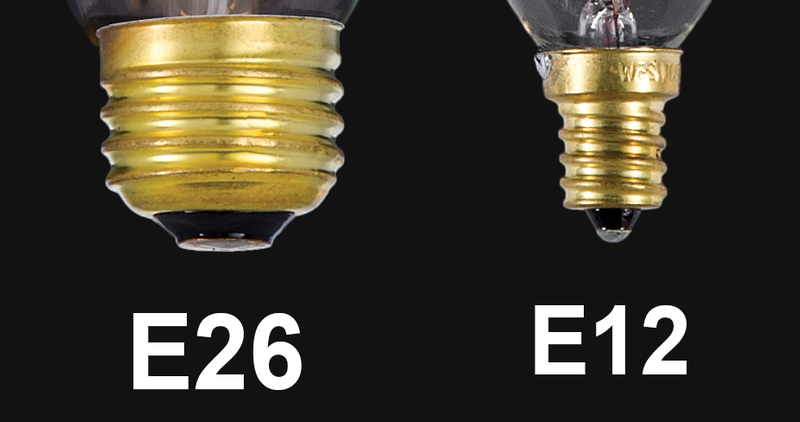 Other common bulb base sizes are the E39 bulb for Mogul sockets and E12 bulb for candelabra sockets. If you live certain areas, some new fixtures are required to have a GU bi-pin type bulb. You will know it when you see it. After you know the fit type you can decide on what you need from a bulb. Thanks to the vast market and the internet, there are different bulb styles, color output and efficiency and a mixture of all three in one bulb. Incandescent bulbs are the traditional bulb with a wide range of brightness from 25 watt to 100 watt. Most of the traditional incandescent bulbs had only one color scale at about 2400K. They are very inefficient with a high heat output. Mass produced Compact Florescent (CFL) bulbs hit the market in the early 2000s and were an alternative to the inefficient incandescent bulbs. These mostly had a spiral type glass tube on the top. It was the first time color was an issue and many bulbs were produced and had a cool white color of 5000K. 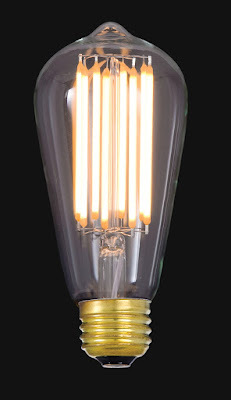 Manufacturers were able to modify the bulbs to get a warmer glow. These bulbs were also advertising longer life span to offset the high cost. For a comprehensive study on the CFL market growth and decline, please read Compact Fluorescent Lighting in America:Lessons Learned on the Way to Market. Light Emitting Diode (LED bulbs are the latest attempt to curb energy consumption while producing light. Many early attempts at LED bulbs were not successful due to high production cost, cold color output, weak lumen output and directional lighting problems. Thanks to consumer demand the most recent LED bulbs seem to be a good fit for an alternative to the incandescent bulb. Vintage, nostalgic, Edison, carbon filament, and antique are some of the word used to describe the reproduction style bulb of early lighting. These bulbs are nice for the space where the bulb is exposed but have a high consumption for the amount of lumen produced. Most recently there have been LED versions of this style bulb but the initial cost mean a long burn time to make up the savings. Specialty bulbs like flicker flame and silicone tip bulbs are more fashion than function. They are definitely designed to be seen and make a statement rather than produce light. These bulbs are perfect for decoration and prop settings. So whether your needing light for a kitchen, bathroom, closet or haunted house, remember there are so many bulbs to choose from and once you know the base type or size you can start to make the decision on what you like. Complete lighting parts stores like Antique Lamp Supply offer a large selection of bulbs and can help answer any question you have.